The strength of America used to be its people. Now America’s strength is geography. If the French Third Republic was surrounded by two massive oceans, it, too, may still exist. Instead, the Third Republic was pulverized by a more vital foe, in the form of the German Third Reich. France tried to fortify its own geography when it built the Maginot Line. So dilapidated was France’s will to exist, so stunted its creativity, the Republic’s military could not see the simple solution to defeating the Maginot defenses: Go around it, through Belgium. Contrary to popular myth, France did not have a weak military. In fact, it was the strongest in Europe, at least on paper. Though German tanks like the Tiger and Panther are the most talked about tanks of WWII, those tanks were relatively rare and did not exist until near the end of the war. France’s intellectual and spiritual dynamism had been gutted after WWI. Just as in modern America, the Left and Right in France became bitter enemies. France’s Right, much like America’s, ( and my own beliefs), believed that the left had lead France into decadence, and the depression of the 1930s fed the country’s cynicism. Sound familiar? Corruption had infected the political, judicial and media systems, culminating in the Dreyfus Affair. The far Right was severely damaged by the event, and the Left surged. France had no interest in war with Germany. But as Trotsky chimed, war had interest in France. Germany annexed Czechoslovakia and France turned a blind eye, eagerly signing the Munich Agreement in a fruitless attempt to appease Hitler. The rest is history. The once proud French Republic bowed pitifully. 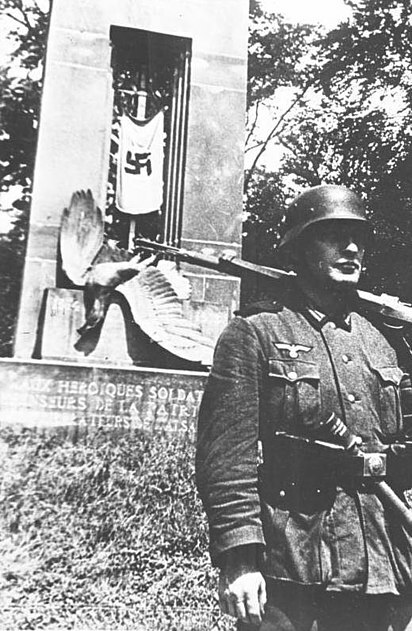 Reich Triomphe: A German Soldat guards a French monument which mocked Germany’s defeat in WWI. Now the tables were turned. Evil won. Evil can be more energized than a sedated “good”which violates the Boy Scout Oath: Always Be Prepared. Lazy and sedated is not really good, after all. I’m going somewhere with this. It’s not about Hitler, The Third Reich, or France; it’s about us. I’ve just taken the long route, as I’m prone to do. My point is that a country’s fate can change very rapidly, especially when internal elites want it to change. The impetus for this article is this piece written by Louis Michael Seidman, published in the New York Times. Seidman is a Constitutional Law professor at Georgetown University. In his op-ed, Seidman contends, essentially, that the United States Constitution should be followed at our leisure, when it is convenient. He defends his position by saying that even some of the Founding Fathers defied the Constitution when they felt it fit, and that currently we spend too much time trying to divine what we thought the Founding Fathers would do instead of just doing what we feel is right. As someone who has taught constitutional law for almost 40 years, I am ashamed it took me so long to see how bizarre all this is. His article hardly carries the tone of someone who’s had a recent epiphany on the matter. What provision in the Constitution has caused our government to continuously spend more money than it has? Is it the same provision that the Greek Constitution had when Greece spent itself into irrelevance? Nor, finally, should we have an all-powerful president free to do whatever he wants. Even without constitutional fealty, the president would still be checked by Congress and by the states. Where does Seidman think that such “checks” would come from other than a Constitution? Freedom of speech and religion, equal protection of the laws and protections against governmental deprivation of life, liberty or property are important, whether or not they are in the Constitution. We should continue to follow those requirements out of respect, not obligation. So the logic is as follows: When future leaders stop respecting speech and religion, they should be able to abolish the free practice of both by fiat. The professor missed my point, I think, which was not that government and people should do as they please, without regard to the Constitution, but that, as I’ve written recently, nothing absolutely compels them to obey the law except force. Otherwise, the Constitution is a gentleman’s agreement in a world where not everyone is a gentleman. At some time after it became clear that Nazi Germany would lose the Second World War, and before the war had actually been lost, one of the senior party officers–perhaps it was Himmler–in confronting the very complicated series of treaty organizations that Germany had accepted with respect to its satraps, wondered out loud, “What, after all, compels us to keep our promises?” It is a troubling question and one that illustrates anew the remarkable genius for moral philosophy the Nazis enjoyed. Moreover, a Constitution, even a flawed one, keeps important ideals highlighted in the mind of a people. It draws a people together, and makes a nation, not just a state. It says, we’re in this thing together and we’ll do our best to make it happen. The Constitution is the glue that keeps our parts from flying into the ether and our people from degrading to tribal warfare. I shy from arguments which summon Hitler. Mostly such arguments seek to shock hearers into agreement. I do not seek this. Well, not only this. Instead, I present the empirical. Hitler, democratically elected, consolidated all powers of the State in the federal government by disintegrating the parliament and he was made Fuhrer. At the risk of appearing to talk nonsense I tell you that the National Socialist movement will go on for 1,000 years! … Don’t forget how people laughed at me 15 years ago when I declared that one day I would govern Germany. They laugh now, just as foolishly, when I declare that I shall remain in power! As the French Third Republic shows us, a country can go from military supremacy to signing an armistice in defeat, in a flash, and small-minded but energized men can wreck a nation. Our country is lucky, given its present state, that it has two oceans to guard it, and not a rock wall. That we have Canada to our north and not the Third Reich. Our Constitution has served us as no Constitution has ever served a nation, making America the light on the hill. We should jealously guard it, even with our own blood if need be. It should be changed only with solemn consideration and amendment. I, Douglas Moore, do solemnly swear that I will support and defend the Constitution of the United States against all enemies, foreign and domestic; that I will bear true faith and allegiance to the same; and that I will obey the orders of the President of the United States and the orders of the officers appointed over me, according to regulations and the Uniform Code of Military Justice. So help me God. This entry was posted in Philosophy, Politics and tagged Force, founding fathers, France, freedom, hobbes, law, liberty, Louis Michael Seidman, nazi germany, New York Times, the third republic, the thrid reich, the united states constitution.